(Image courtesy of Thunder Lotus Games). Thunder Lotus Games was founded in 2014, and quickly rose to success with their first game, Jotun, which was released on Steam in 2015 and onto console platforms the following year. 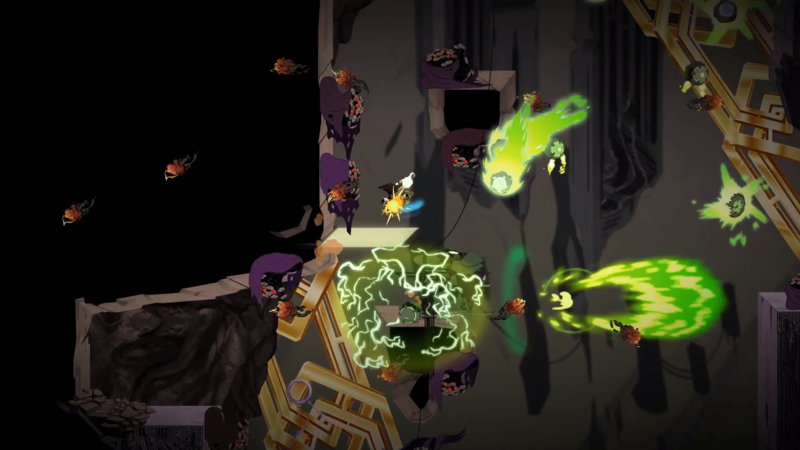 At E3 2017, I was able to catch up with Rodrique Duperron of Thunder Lotus Games, and both demo and talk with him about their sophomore title, Sundered. My hands-on impression of Sundered at E3 2017 is available to read here, but suffice to say: I was amazed with how Thunder Lotus Games was able to take a classic genre, Metroidvania, and make it work with a partially procedurally generated world that is also hand-drawn in an incredibly gorgeous way. You can find out more about Thunder Lotus Games on their website, like them on Facebook, tweet them on Twitter, and watch them on YouTube. Jotun is available now for purchase, and Sundered will be coming out soon on PC/Mac/Linux and PlayStation 4! This interview has been edited for clarity, content, and length. Operation Rainfall: Hello, my name is Quentin H. with Operation Rainfall, and you are? Rodrigue Duperron: I am Rodrigue Duperron. I am the Marketing and Communications Specialist for Thunder Lotus Games. OR: We are here today for Sundered. 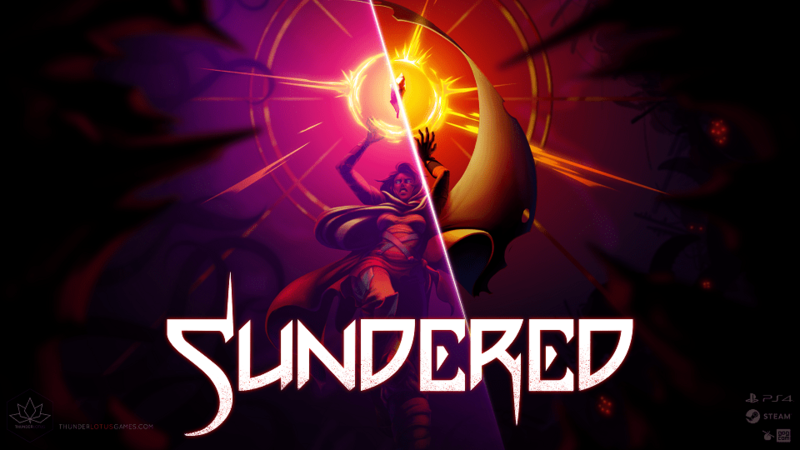 What type of [game] is Sundered? 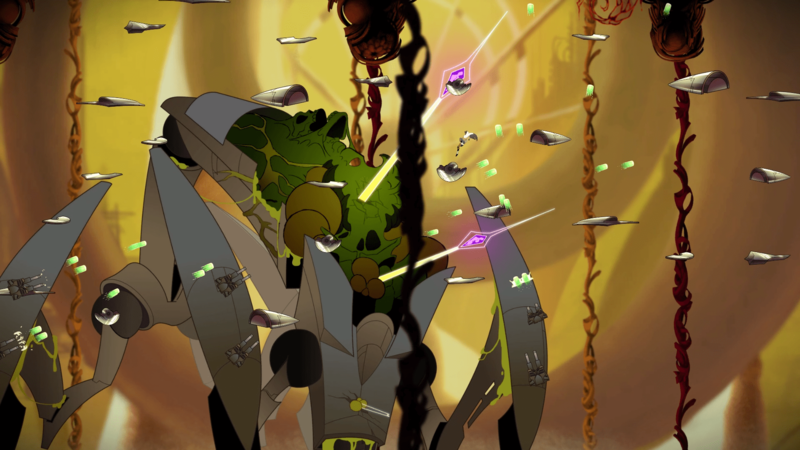 RD: We are calling Sundered a replayable Metroidvania game. You play as Eshe, a warrior who fights in a ruined world. (Image courtesy of Thunder Lotus Games). OR: What do you mean by “a replayable Metroidvania game”? RD: Well, Metroidvania is pretty self explanatory- we don’t reinvent that aspect of it. But the replayable part is the procedural generation that we have in the game. 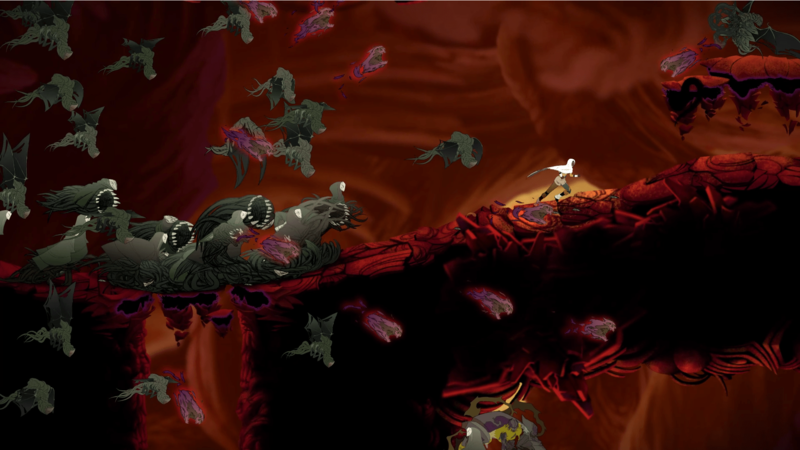 So when you die in Sundered, the map is procedurally generated around you, as are the enemy encounters throughout the game. “And so we took what we thought we did best in Jotun. We took the hand-drawn art, we took the very immersive feeling of the world, we took the epic boss fights. OR: One of the hallmarks of Metroidvania is that you can backtrack using the powers you gain, and access new areas that you couldn’t before. How does that correlate to a procedurally generated game? RD: There are main areas in the game – specific areas in the game- where you are going to acquire new abilities, you’re going to take on a boss, where we’re going to tell a part of the story to you- those elements of the map are in the same set place. So when you clear that room, when you kill that boss, when you gain that ability, it’s done and it will always be done for the rest of the game. It’s only the rooms that connect to those main rooms that are changing each time you die. OR: The art style in this looks hand-drawn. Is that correct? The animation in Sundered is all done by hand, which serves to create a rich and gorgeous world. (Image courtesy of Thunder Lotus Games). OR: Can you tell us a bit more about your art team that drew the graphics for [Sundered]? 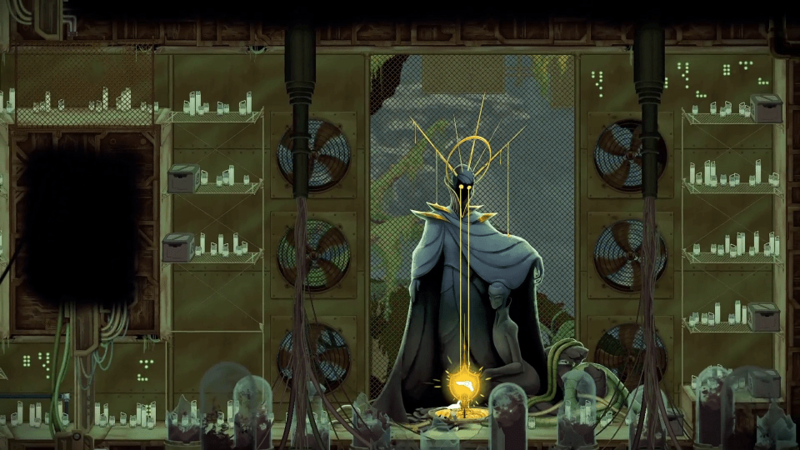 RD: If you’re familiar with Jotun, [then you know it] was a hand-drawn Viking game. We had the same core art team on this project, and [they wear] their influences on their sleeves. They grew up on the hand-drawn animation films of the 1980’s, they’re in love with a director named Don Bluth, who did An American Tail, The Secret of NIMH, and things like that. And they try and emulate that and bring it into a darker, more mature gaming territory. 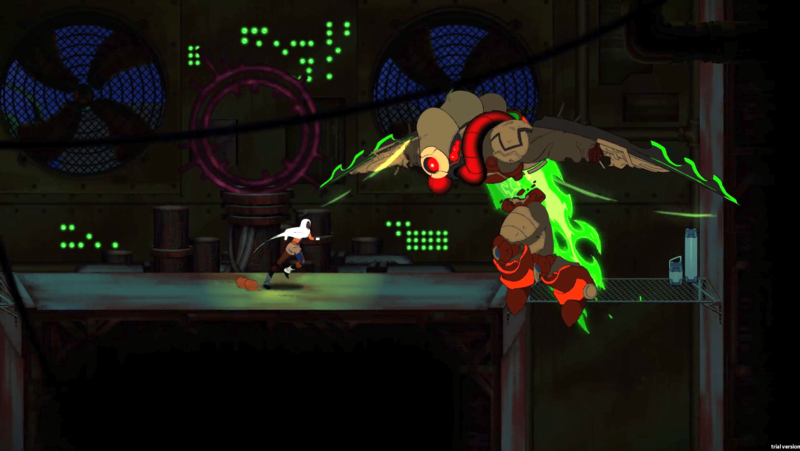 OR: There are multiple abilities that you gain, which is typical of a Metroidvania. Can you tell us a bit more about them and if they can be leveled up? RD: In classic Metroidvania fashion, you are acquiring new abilities which will allow you to access different areas of the map. At the beginning of the game, you don’t yet have a double jump, and there are some jumps you can’t make. But once you acquire that, you can [move] onto different areas of the game. Now, the kicker in Sundered is [when the game] asks you if you want to resist or embrace the ‘dark power’. When you kill a boss or a mini-boss, they drop their evil essence which we call ‘elder shards’. And those elders shards can be brought back to where you got one of those Metroidvania-style abilities, and you can ‘corrupt’ that ability, making it an Eldrich – a more powerful- form. And in practice, say for instance, if you’re going to acquire a power dash – which gets you left or right fairly quickly- if you corrupt it, it will get you in eight directions instead. So you get a vertical mobility that is an obvious gameplay advantage. And the tradeoff is that your character is losing his humanity by degrees each time you corrupt. 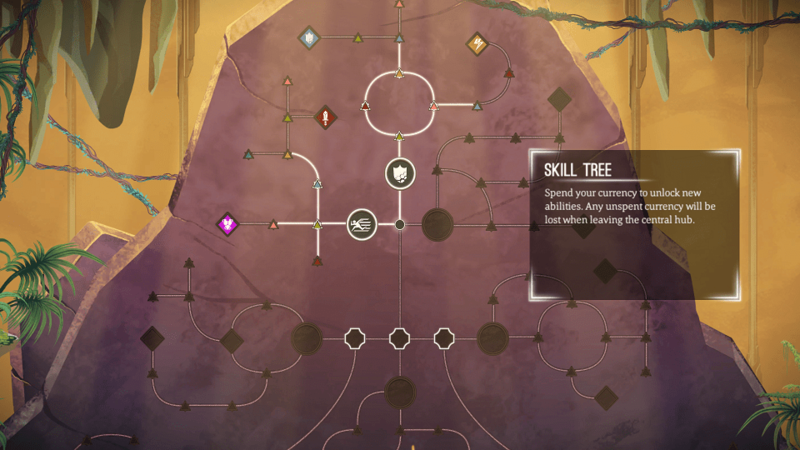 In the Hub, you can unlock new skills for Eshe. (Image courtesy of Thunder Lotus Games). OR: Who do you play as in this game? What is the background lore [of Sundered]? RD: You’re playing as Eshe. Eshe is a wanderer in a ruined world. It is the ‘end times’, and you’re a mechanic just trying to survive by scavenging. One day, you’re trapped in a sandstorm and you’re sucked into these mysterious caverns that seem to be ever-shifting. The basic gist of the game’s story is that you want to fight through the caverns to stay alive, but you’re going to discover that the power keeping you there is also the power that destroyed the world to begin with, and what’s more – you can have some of that power for your own if you decide to do so. OR: This game is coming out on Windows, Mac, Linux, and PlayStation 4. When it is coming out? RD: It is coming out next month in July. We don’t have a specific date to share yet, but we will soon. OR: You partnered with Limited Run Games for the physical edition of [Sundered]. How did that partnership come about? RD: We were already in discussions with them for what was finally announced yesterday, a Limited Run [Games physical] version of Jotun. So when we started thinking about the physical collector’s edition for Sundered, they were basically on top of our list. They’re just swell guys, they have a love of the games. They make really great products, so it was a no-brainer. OR: I know that it was mentioned on Kickstarter that you were working with [Limited Run Games]. Is there going to be a physical edition of the game that is offered not through Kickstarter but through [Limited Run Games]’s website or through [Thunder Lotus Games]’s website? RD: Yes. They didn’t mention that during the campaign. So there will be a collector’s edition just for the Kickstarter backers of a certain level, and that’ll have some physical swag in that and extra goodies. Their normal physical edition run was also announced at that time. It’ll probably come a little later, but yeah, we’re signed on for that as well. Sundered has multiple endings. Will you resist or embrace? (Image courtesy of Thunder Lotus Games).